New restaurants, new chefs, new menus and new food all kept a food lover and restaurant column writer busy this year in D.C.
Every day a new place was opening, some I was able to review, others are still on my list. When all was said and done however, I had the opportunity to dine in some of the best restaurants in town and enjoy some of the finest food offerings available. And in the process I got to expand my own horizons. Then, in August, I realized that I may be in a bit over my head, so I brought two knowledgeable foodies to Izakaya Seki, the first restaurant I was concerned about not being knowledgeable enough to cover fairly. Izakaya Seki opened in August by father and daughter Hiroshi and Cizuka Seki; this new establishment features traditional Japanese dishes and delicacies. Delicacies such as cuttlefish; at that point I had no idea how it was even supposed to taste. Other items like the fresh scallop Carpaccio were delightful and set the tone for three hours of delicious food. Izakaya Seki still remains one of my most challenging and rewarding columns to date. While Japanese cuisine was outside my comfort zone, there were many other restaurants this year I felt well prepared to write about. Ristorante Posto, in Logan Circle, was serving a new spring selections when I first set foot into this unsuspecting location, and a new pastry chef was dishing out delicious deserts. The pastry chef has since left, but Posto remains a favorite spot for delicious Italian food and brick oven pizzas. In May, at a Taste of Pride featured special, I discovered Jack Rose Dining Saloon. The food was excellent and in an environment where whiskey bottles reached toward the ceiling, I discovered I enjoy scotch. Mike Isabella, gay chef Jamie Leeds, and Taylor Gourmet all opened new locations this year. Isabella’s Bandolero in Georgetown serves up his take on traditional Mexican dishes and strong margaritas. Standouts included the course we dubbed “Mexican Sushi,” like the blue crab taquito with coconut and red chili. The suckling pig tacos and the nachos with crispy goat and goat cheese also pleased all the diners at the table. For Leeds, and her new Hank’s on the Hill she teamed up with “mixtress” Gina Chersevani, whose Eddy Bar is a key component of the new space. This new 40-seat location serves up Leed’s classics like the lobster roll and the Meat and Two option, as well as Chersevani’s exquisite “storytelling” cocktails. Longtime friends Casey Patton and David Mazza opened up a third Taylor Gourmet on 14th Street this year. These traditional Philadelphia-inspired sandwiches battled against sandwich shop Sun-de-Vich — Taylor won for best cold cut-based sandwiches and Sun-de-Vich won for its creative and worldly offerings. Sandwich lovers are in for a treat at either location. Carnivores also have plenty of new options. Gay business partners David Winer, Josh Hahn and Antonio Oquendo opened their fifth restaurant in D.C. called The Pig, a pork-centric restaurant that focuses on snout-to-tail dishes from locally sourced ingredients. The braised pork cheek was a favorite and if you’re up for the challenge, try the Sundae Bloody Sundae that includes pasteurized pig’s blood. Another meat-lovers paradise is Kangaroo Boxing Club in Columbia Heights. If you love barbeque, then there’s a dish on the menu for you here. This year 14th Street began its transformation into a prime dining location. Pearl Dive Oyster Palace opened just over a year ago, the new Matchbox has opened, Ted’s Bulletin and many others are scheduled to open in the near future. Part of this transformation includes the new Masa 14 rooftop, which opened at the start of the summer. Masa 14 also welcomed new executive chef Adam Goldman to the mix at this Latin-Asian fusion restaurant. Another newcomer to the street called The Drafting Table has become the new local gastro pub in the former ACKC space. No dinner is complete without a little sweetness at the end. I can never review a restaurant without at least a sampling of the desserts. One of my favorite meals this year took place at gay-helmed Art and Soul. We all had delicious entrees and to finish up the party, we tasted most of the items on the dessert menu. And to end my reviews for the year, I sampled all the delicious sweets available at Bloomingdale bakery Grassroots Gourmet. 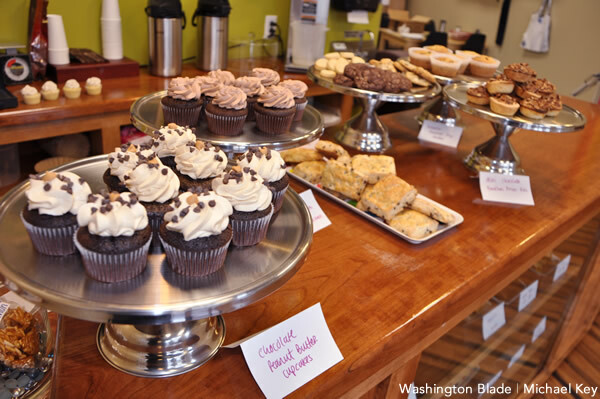 Every item at this gay-owned and -operated bakery was divine. A sweet ending to a year filled with delicious food and reviews.